According to Israeli media, over 200 Israelis marched from central Jerusalem to the neighborhood of Sheikh Jarrah, Friday, to protest the eviction of a Palestinian family from their homes. The demonstrators marched on West Jerusalem’s thoroughfare until they crossed over into the Palestinian neighborhood, where they were met by dozens of local Palestinian protesters. On Friday, police took two residents of Sheikh Jarrah, who marched in the direction of the Israelis, into custody — one for waving a Palestinian flag, and the other — a minor — following settler complaints to the police. The minor was only detained for a short period of time, although his mother collapsed and had to be taken to the hospital upon his detention. Meanwhile, during the Israeli march toward Sheikh Jarrah, a passerby threw eggs at the demonstrators. Among the marchers were Joint List head Ayman Odeh and Yousef Jabareen, also of the Joint List, 972mag reported. After the marchers arrived in the neighborhood, one of the Israeli protesters climbed the Shamasna family home and removed the Israeli flag hung by settlers who had commandeered the house. In response, the settlers attacked some of the protesters, throwing stones and pepper spraying them. 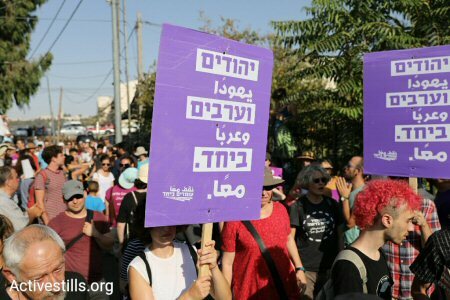 Two Israeli marchers were arrested. Palestinians in occupied East Jerusalem performed Friday prayers in front of the Shamasna family home, in an act of protest against the family’s forced eviction. Members of the Shamasna family participated in the prayers held outside their home, along with Palestinian Mayor of Jerusalem Adnan al-Husayni, Fatah’s Jerusalem Secretary Shadi Mtour, Fateh official Hattem Abd al-Qader, and other religious and national figures. Sheikh Abdullah Alqam, who gave Friday’s Khutbah — Islamic sermon — condemned the expulsion of the Shamasna family from their home and said that the Israeli legal system was “biased” towards Israeli settlers. Alqam said that, despite Israel’s relentless attempts to displace Palestinians from Jerusalem, Jerusalemites were determined to defend their rights and existence in the city. Mohammed Shamasna, 45, and his son Dirar, 23, were released from Israeli jail on Thursday after being detained during the settler-driven eviction on Tuesday. While earlier reports noted that no release conditions were placed on the two, locals said on Friday that Mohammed was banned from entering Sheikh Jarrah for two weeks. It was unclear if this also applied to Dirar. According to UN documentation, 180 Palestinian families — comprising of 818 individuals, 372 of whom are children — are at risk of forcible displacement in East Jerusalem owing to settler-driven evictions. UNRWA noted that in Sheikh Jarrah, 60 percent of those at risk of displacement are Palestinian refugees. Gerald Kaufman, the Father of the British House of Commons and the longest-serving British MP who was known as a scathing critic of Israel, died on Monday at the age of 86, according to his family. Kaufman, who is Jewish from Polish origins, served 47 years in the British Parliament as an MP of the Labor Party. He attacked the Israeli "Nazi policy", which put him among the top British figures targeted by the Israeli government and media. Since he was elected MP for Manchester city, north of Britain, Kaufman was known for his hardline positions toward the issues of Labor, wealth and social justice in his circle, as well as his hostility to Israel on the foreign political level. against an Israeli military operation against the Gaza Strip, and calling for ending the war. He described Israel as "a rogue state" and accused the Israel's then-Prime Minister, Ariel Sharon on the BBC of allowing his soldiers to use "brutal methods against Palestinians," and "staining the star of David with Palestinians' blood." Kaufman served as shadow foreign secretary from 1987 to 1992 in the labor government and maintained his support for Palestinians and all just cases. In 2004, he published a strongly-worded article in the Guardian newspaper calling for imposing international sanctions on Israel similar to the sanctions that were imposed on South Africa during the Apartheid era. He accused Israel in 2009 of exploiting the slaughter of Jews in the Holocaust in Europe in the forties of the past century to justify the Israeli army's crimes in the Operation Cast Lead waged against the Gaza Strip. In another earth-shaking article, the British MP accused Israel of committing war crimes and accused the Israeli voters of being involved in these crimes. Palestinian and Jewish activists have filed a lawsuit with a US court against Israeli premier Benjamin Netanyahu and other officials over war crimes they committed against Palestinian citizens. 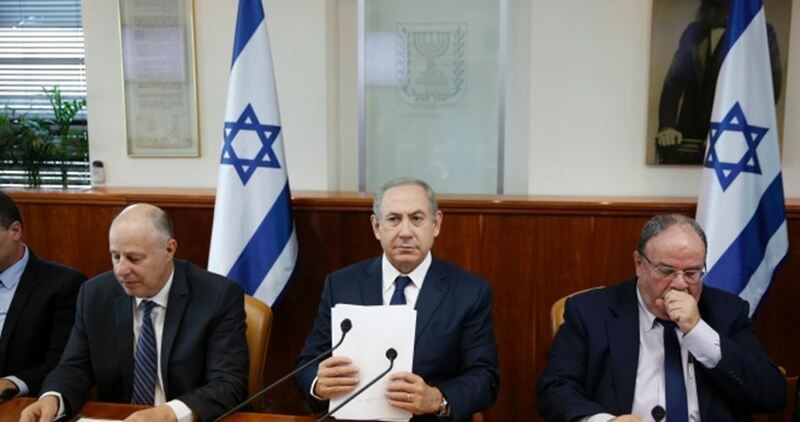 According to Maariv newspaper on Tuesday, 35 Palestinian and Jewish activists, all American citizens, are suing Netanyahu, his war minister Avigdor Lieberman and former foreign minister of Israel Tzipi Livni. The legal complaint accuses the three Israeli officials of committing war crimes against the Palestinians and funding illegal settlement construction in the West Bank. The lawsuit also names David Friedman, Trump’s ambassador-designate to Israel, and his charity, American Friends of Beit El Yeshiva Center, as being a major fundraiser for illegal Israeli settlements. The complaint was prepared by noted attorney in Washington Martin McMahon, who has filed three other lawsuits that are currently before US courts and aim to cut off the stream of funding from the US to Israeli colonialism.